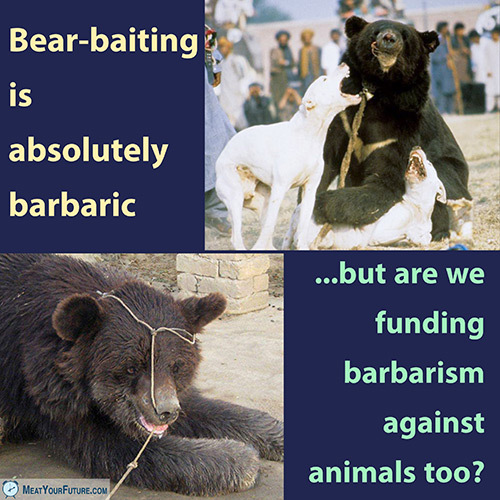 Bear-Baiting is Barbaric, But Are We Funding Barbarism Against Animals Too? “Bear-baiting” involves tethering a bear to a rope in the center of an arena and pitting them against other animals (such as dogs shown here). The bears’ canine teeth are often removed and their claws filed down to put them at a disadvantage. If the dogs pull the bear to the ground, they are said to have “won” the fight. There are so many things wrong with this “tradition”, we don’t know where to begin. Fortunately, bear-baiting is uncommon. As far as we know, it currently only occurs in Pakistan and some backyard operations in other places, and there are many organizations trying to end it. But there is another tradition that is commonplace and occurs on every corner of the globe – something that people from all walks of life do three times a day that results in even more unnecessary suffering and harm to innocent animals than bear-baiting (or anything else we can think of). What tradition is this? Eating animal foods. According to the Academy of Nutrition and Dietetics, the largest organization of nutrition professionals in the world, the amount of animal foods we need for our health is EXACTLY ZERO. And, this is not controversial within mainstream medicine or nutrition. Although we don’t need to consume animal foods, because of nutritional misinformation, convenience, pleasure and tradition, our society continues to consume massive amounts of animal foods – and, in doing so, we participate in and cause horrific suffering and killing of billions upon billions of vulnerable animals. We impose an unspeakable amount of fear and harm for no better reason than our whim and stubbornness of eating animal foods, when we could easily just nourish ourselves with plant foods instead. On top of all that, animal agriculture happens to also be causing immense environmental devastation. Among other problems, it’s by far the largest land-user on the planet and the number one driver of global deforestation. Please understand that your actions have a direct and profound impact on other animals and the planet. If you haven’t already, please give these issues serious consideration and go vegan. What Do His Eyes Tell You?